In 2016, the regular All-Russian Agricultural Census will take place from 1 July till 15 August and from 15 September till 15 November in remote locations. All data as of 1 July 2016 will be taken into account when conducting the census. It is aimed at 31,400 agricultural organizations, 29,600 microcompanies, 167,600 farms, 55,000 self-employed entrepreneurs, more than 20 million private subsidiary plots, as well as 80,000 horticultural, market-gardening and dacha non-profit associations, which include 13.8 million plots of citizens. Preliminary results of the 2016 census are to be summarized in Q4 2017, and the final results will be announced in Q4 2018. 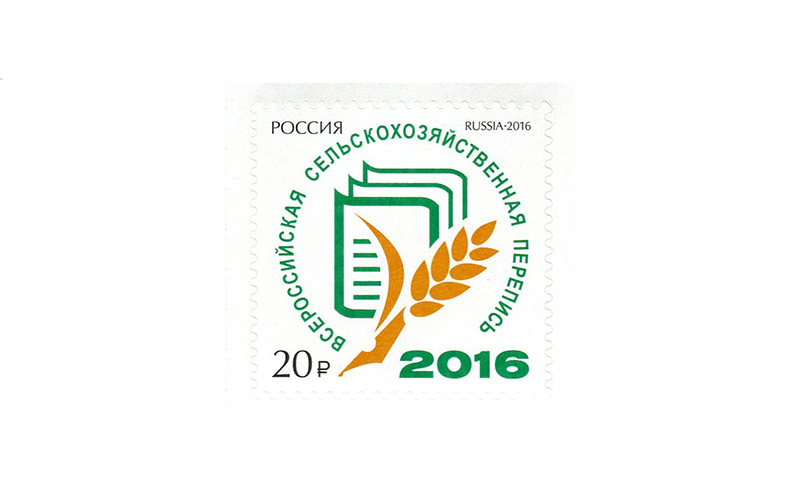 The postage stamp features the All-Russian Agricultural Census logo.